The best pool water test kit is the Taylor K-2006. I’ll make it that simple. You can buy it here: Taylor K-2006 . If you’re not convinced, please feel free to read this review which is based on my own experience of several pool testing kits. The best pool water test kit will become obvious to you not from this review, but from your own experience. Well, okay maybe not fun for everyone, but it is interesting. What is the best way to test your Pool Chemistry? Having nearly completed my first year of experience caring for my own pool, I’ve learned a lot about what to look for in a pool water test kit. In just one season, I have used the entire gamut, from the old fashioned liquid tests kits, to the handier and easier test strips, and in 4 different brands. So, which is better? The answer is that both types have their purpose, but as I will explain later, some pool water test kits do offer a greater degree of accuracy and number of tests. What are the Different Types of Pool Water Test Kits? My own swimming pool this summer provided me with some unexpected challenges and problems which go beyond the scope of this review. However, in meeting these challenges, I spent well more than my share of money on pool testing products. This is partly due to my inexperience but also the desire to learn how to do the best job possible in insuring sparkling clear water. My goal in this review is give a brief explanation of the different types of test kits, explain what each of them does and how they work, as well as to give you my own advice on which particular product brand works best and easiest for me. This review assumes that, like me, you have a chemically chlorinated pool. There are different products out there for different types of pool such as those that use salt and chlorine generators to manufacture their own chlorine. I will not cover these products, and stick to those which address the needs of the traditional, chlorinated pools. I will discuss and compare 4 different products that I’ve used this year: Aquachek Select and Aquachem 6-way Test Strips. The HTH 6-Way from Walmart, and Taylor Liquid Test Kits. While using these products, I’ve come to expect 5 criteria from a pool testing kit: Convenience and speed, ease of use, accuracy, price and tests. How are Pool Test Kits on Convenience and Speed? Convenience and speed go together when it comes to pool testing. Test strips are by far the fastest, most convenient way to test your pool water. They work by simply dipping a strip in your pool water, waiting 15 seconds, then visually comparing the colors with a chart. The matching color shades on the chart will tell you in Parts Per Million (PPM), the chemical amounts in your pool. Both the Aquacheck and Aquachem test kits reviewed, here, offer 6 tests: Total Hardness, Total Chlorine, Free Chlorine, pH, Total Alkanility, Cyanuric Acid (Stabilizer). There are other less expensive test kits which only do 4 tests (leaving out Total Hardness and Total Chlorine), but I recommend sticking with the products that do 6 tests because they are only a couple of dollars more, you will learn to want those additional tests as you take an interest in water testing. Both the Aquachem and Aquachek products are convenient and fast. In 15 seconds, you will be comparing your results with the included color chart and be able to record your answers in less than a minute. The liquid tests kits are not nearly so convenient, and definitely not as fast. They basically work by adding pool water to a sample test tube, adding a few drops of a color indicator and in some cases, adding another chemical called a titrant, which makes the sample change colors after several drops. I will explain the details on this later, but suffice it to say that the liquid test kits are not nearly as convenient since you are dealing with a number of different testing agents, titrants and test tubes, rather than dipping one single strip into a sample of water. Furthermore, you will need fresh water supply nearby to rinse your testing tubes or comparators after each test, so you can start with clean pool water on your next tests. That means a minimum of 6 tests for the product. The Taylor K-2006 offers an even greater number of tests, but for the sake of comparison, it will take a good 15 minutes with either of the liquid test kits to do the same number of tests that you did in less than a minute on either of the test strip products. The Taylor kit has it’s testing instructions very conveniently printed on the inside of the box lid, whereas the product forces you to use a little folded instruction manual which is likely to get wet and/or lost. For convenience between the two test strip products, I give the Aquachek product the edge over Aquachem due to it’s handy, transparent plastic-sealed color chart which attaches to the bottle, and prevents any fading from water as your holding the strips up to the chart for testing. The Taylor K-2006 is faster and more convenient than the HTH due to its handy box with printed instructions. But for overall speed and convenience, nothing matches either of the 15-second test strips. Something that is convenient is also easier to use, right? Not so fast. The answer to that is not as cut and dry as you might first believe. Which Pool Test Kits are Easiest to Use? What is fast and easy seems convenient. That is, until you worry about determining the actual test results. I’ve found it to be very difficult to match the colors of the strips results with the actual color charts and numbers. Making it doubly difficult, is the fact that the longer you wait, the more the colors fade and change colors in the sun as you look at them. Between the two, test strip products, I give the Aquachek product a slight edge over the Aquachem, due to its plastic encased color-comparator chart. With the aquachek test strips, it is a little bit easier for me to determine the color shades, but I must admit that could be due simply to user preference. Determining an accurate result is guess work at best with either product. .To prove this, I’ve used additional family members to compare results, proving that our answers can vary as much as 1 to 2PPM. While the liquid test kits still require some subjective comparing of colors and shades, I’ve found it to be much easier to determine an accurate measurement looking at a liquid and comparing it to the corresponding colors. Furthermore, unlike the test strips, the liquids do not change shades or fade overtime. You can take your time looking at the color of the liquid and matching it with the corresponding number. The flip side of this, is that the liquid test kits do require you to accurately measure your water sample and count numbers of drops in order to perform the tests. The Taylor K-2006, due to it’s handy, inside of the box instructions is slightly easier to use than the HTH Liquid 6-Way Kit. When it comes to ease of use between the 4 products, the test strip kits have an edge because it requires fewer steps, however some of the advantage is negated by the difficulty in determining the color and corresponding number measurements. The Aquachek and Taylor K-2006 products are slightly better in this category. Both have better instructions, and the Taylor K-2006 even includes a waterproof Pool Spa Water Chemistry Guide. What could be more handy than that? Which Pool Test Kit is the Most Accurate? Neither of the two test strip products are as accurate as the HTH or Taylor K2006 Liquid Test kits due to the difficulty in determining the colors as described above. By far, the leader in accuracy is the Taylor K-2006 . The K-2006 has the edge in accuracy for a couple of reasons: The FAS-DPD Chlorine test included in the K-2006 is unique in that it allows you to determine free and combined chlorine levels in increments of .2PPM all the way up to 20PPM. The results of this test are flawlessly accurate. Unlike other tests that force you to match colors with a comparative color chart, the FAS Chlorine test uses an entirely different method which is extremely accurate and explained in more detail below. The Test Strips and the liquid kit are limited to levels of .5, 1, 3, 5 and 10. I believe the liquid kits offer more accurate results. In using family members to compare results, we were in much closer agreement than we were with the test strips; within 1PPM, usually less. I should also mention that the Taylor does come with a very complete guide for determining what your results mean and helping you to reach the most accurate conclusion on what all of these chemistry numbers mean for your pool water. The Taylor is the most accurate test kit that I’ve tried. Is The Best Pool Testing Kit the Most Expensive? 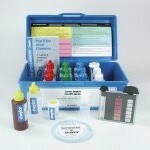 The HTH Liquid test kit can be had at discount retailers such as Walmart for around $15.00. You get about 3 months worth of tests assuming you test your pool once a week. The exception is with your CYA or (stabilizer) test which will give you only three tests maximum. The Aquachek and Aquachem will cost you about $13 – $15 for a 50-test bottle of strips. Unlike the HTH product, you will get exactly 50 tests for every available test there is. The K-2006 will set you back $49 – $69 based on various online retailers and pool stores. The kit comes with enough tests to last you three months, provided you only test once or twice a week. This is a professional product for getting the most accurate and complete results for maintaining your pool. There is a reason for the extra cost, as you will soon discover in the next part of the review. What Tests Are Available In Each of the Pool Testing Kits? Both the Aquacheck and Aquachem test-strip products have 6 tests: Total Hardness, Total Chlorine, Free Chlorine, pH, Total Alkanility and CYA (Stabilizer) Different shades of colors are used for each test, along with indicators letting you know how your water rates in terms of LOW, OK, IDEAL Both test strip products include instructions for what chemicals and amounts to be used to bring your water to its desired levels. Unlike the liquid test kits, one dip results in all 6 tests. Since pool chemistry goes beyond the intentions of my review, I will try to relate the importance of what these tests do without getting into too much unnecessary details. The chlorine test is what sets the K-2006 apart from all others as the best pool water test kit. This is in large part due to the FAS-DPD Chlorine test which makes it virtually a cinch to determine both Free Chlorine and Combined Chlorine. Also, the K-2006 measures Chlorine all the way up to 20PPM. The FAS-DPD Chlorine test works like this: You put in a couple of scoops of the included R-0870 powder which turns your water sample pink if there is any free chlorine present. Next simply add from the R-0871 bottle while counting drop by drop, and swirling after each one until your water sample turns completely clear. Multiply your result by .2 to get your Free Chlorine results in Parts Per Million (PPM). For example, if your Water Sample turned clear after you added your 20th drop, your free chlorine equals 4 PPM (20 * .2) Furthermore, the FAS-DPD Chlorine test gives you the flexibility for choosing a smaller water sample at less accurate measurements of .5 PPM. This is handy when you know your have very high chemical levels and want to conserve on testing agents. In order to determine your Combined Chlorine, you use your same water sample, using another agent to turn the color pink again, then going back and repeat your steps, drop by drop, counting them as you go, until the water turns clear once again.. Just as is the case with the HTH 6-Way Liquid kit, testing your pH with the K-2006, requires you to add 5 drops of an agent into your pool water sample colorator tube which turns your color a shade between yellow, orangish-pink and red. You will then compare the color to the chart on the comparator which ranges from 7 to 8 on the K-2006. The HTH has a slightly larger range on it’s colorameter of 6.8 to 7.2. Score one slight advantage for the HTH. Total Alkalinity is one of the more difficult tests for me with either of the liquid test products. You begin with a sample of water, and then add 5 drops of one agent which makes the color red. Next, you will use the included bottle of titrant and add drop by drop until the color turns from Red to Blue. In my case, this required over 20 drops because my TA is so high! My difficulty was that my sample was turning more of a purplish color than blue, making it hard to distinguish from the original pink hue and not knowing when to stop adding drops. I had this same problem using the Calcium Hardness test, but thanks to the very informative manual included with the Taylor K-2006, I learned this is because I have metals in my water. By adding a few of the titrant drops to the sample, beforehand this problem is resolved. So, once again, even for TA, I believe the K2006 is the best pool water test kit. The K2006 takes things one step further for getting a reading on the balance of your pool water. Included with the K-2006 pool water test kit is what’s known as the Taylor Watergram Calculator. This is basically a circular dial, allowing you to line up measurements of pH, Hardness, Water Temp and Total Alkalinity, and indicating a number known as a Saturation Index. The Saturation indicates whether or not your pool water is in balance (usually a number between -.5 and +.5.) Water that is not in balance can be corrosive to your pool and/or components, or cause scaling and cloudy water. Additionally, you can do an acid-base-demand test, following your pH results. This is achieved by adding the included acid-base-demand reagent until the pH color matches the colorameter of your desired results. You then refer to the watergram for instructions on how much of what chemical to add to achieve your desired pH Balance. The CYA or Stabilizer test is pretty much identical between the HTH and Taylor. This is known as a turbidity test, and basically works by adding drops to a test tube, making the sample cloudy until you can no longer view a black dot at the bottom of the test tube. You then, simply match the corresponding number on the test tube which represents your CYA level. That basically, concludes the extent of testing on the various kits. The K2006 has some additions and variations which the other kit do not have, but it is the FAS-DPD chlorine test that really sets it apart. The Taylor K2006 is the best pool water test kit hands-down. However, the test strips definitely have their place in everyday pool testing, due to their convenience, speed and cost. I have changed my mind since this article was first written nearly 10 years ago. I used to like having the strips, but after several more years of experience using them, I just don’t see any advantage to them anymore. With the K2006, you will be able to know beyond the shadow of a doubt what your precise levels are, but do you really want to sit down and take 15 minutes every day to do it, and pay for costly agents and titrants three or four times a summer? After some comparative practice with the two, you will be able to use the test strips on a daily basis for getting a pretty accurate estimation of the 6 included tests. I am actually able to consistently come within .5 to 1PPM difference with the test strips, which is close enough for getting a daily estimation of FC. The K2006 can be used on a weekly basis, when serious pool problems occur, or when you have the time to be more thorough about your testing. The HTH 6-Way test is okay as a cheap solution, or for Bromine pools, but once I compared it to the K2006 by Taylor, I would have been glad to pay the difference to have the better product in the first place. Just to be fair, HTH makes a variety of other variations of their liquid test kits. The one used in this review is commonly found in Walmart and other discount stores for about $15.00. There are also other a couple of other branded versions of the Taylor K2006: The TF-100 and Leslie. I believe both of these are rebadged products of the K2006, but with different volumes, and possibly some other changes or additions. Feel free to compare them online. At any rate, I would not be without one of the three. If you want to be serious about testing your pool, the FAS-DPD chlorine test is an absolute must. For a complete review on the best pool water test kit for Salt Water or Saline Pools read my review on the K-1766 Salt Water Test Kit. How do you rate the Taylor K-2006?